I'm too young to feel so out of touch with the times, but nevertheless, I do. So many things leave me asking, "Why?" Take, for example, the new Chelsea Handler show on Netflix. Why do I want to see Chelsea Handler do drugs and promptly get sick in a bucket? And why did Kate Hudson feel the need to Instagram a photo of herself, bare-bottomed and in a bubble bath, in an effort to make her boy toy, Nick Jonas, jealous? Perhaps the question I ought to be asking myself is, "Why am I spending so much time reading about this trash on the Daily Mail?" And after reading last week's New York Times article, "The Art of Home Staging", I felt even more out of touch than before. 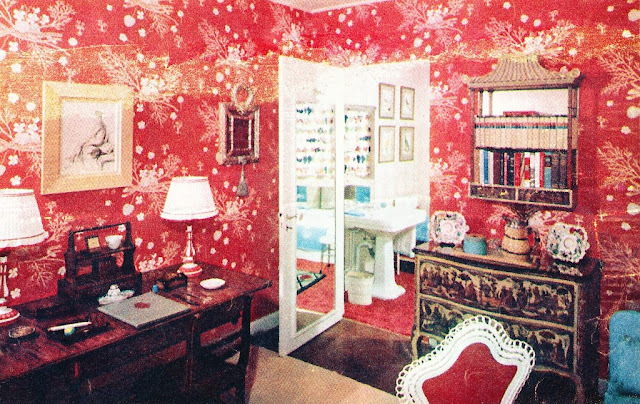 If you haven't yet read it, I highly recommend doing so, because the piece confirms what most of us already knew- that flair and individuality, those once-lauded virtues in the world of interiors, have become real deal-killers when it comes to the buying and selling of residential real estate. The way to sell your home quickly and for more money? Hire a home stager to banish the old and bring in the new- and banal. Before I go on, I should mention that I'm all for doing what is necessary to sell one's home. If staging means more traffic and more offers, then by all means, do it. What I find troubling is not home staging itself, but rather the innocuous décor that buyers seem to prefer. If what real estate agents and home stagers say is true, home buyers want to see white walls, plain-jane curtains, contemporary furniture, and a live-edge coffee table. Do these buyers not realize that the furniture moves away after closing? 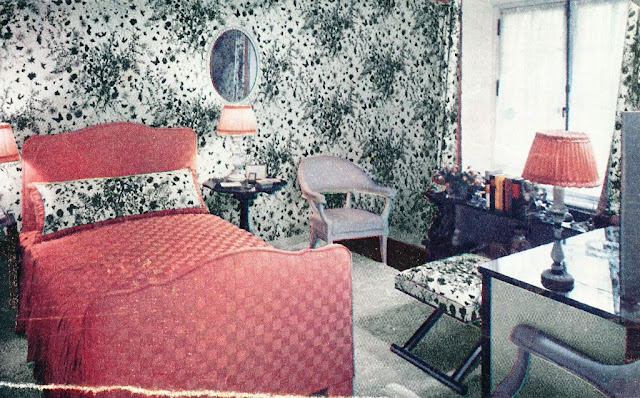 And is it really that difficult for people to see past a home's paint and wallpaper, furniture, fabrics, and- heaven forbid- antiques in order to assess a home's bones? What really struck me is that one of the article's examples of a successfully staged apartment was that of designer Jean-Paul Beaujard. His New York City home was featured in Architectural Digest about five years ago, and I was so taken with the interiors that I actually wrote about it on my blog in 2011. 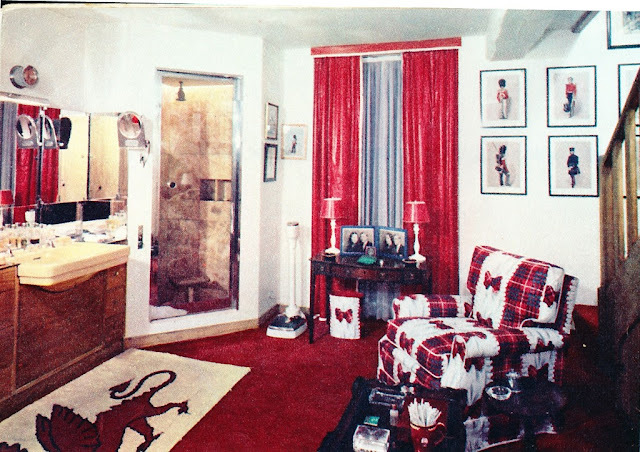 But, sadly, such interiors don't sell homes these days, so the apartment's listing agents at Corcoran suggested bringing in a home stager. 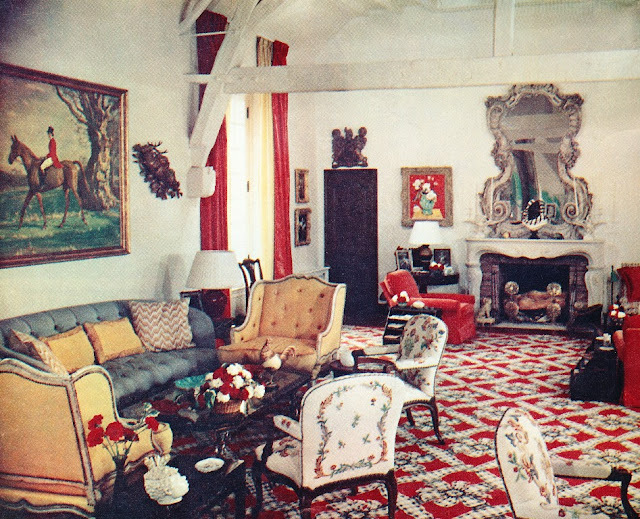 All of Beaujard's beautiful furniture was sent away to storage, while contemporary furniture and plain white fabrics were brought in. 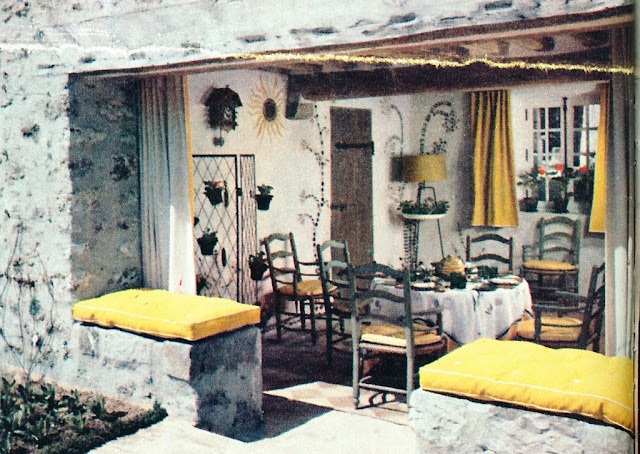 (Oh, and the walls were painted white, of course.) 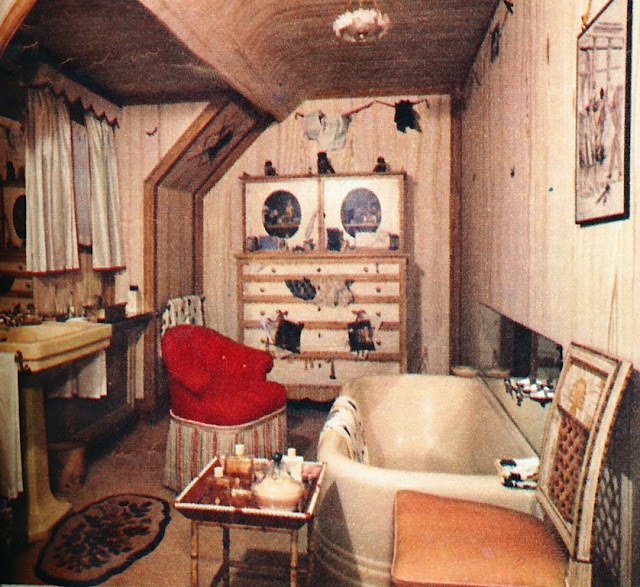 Beaujard was quoted as saying, "It's the complete opposite of what I like," but admitted that, "now, you see the proportions of the apartment better. Even I was surprised." The staging worked, because the designer recently accepted an offer on his apartment. 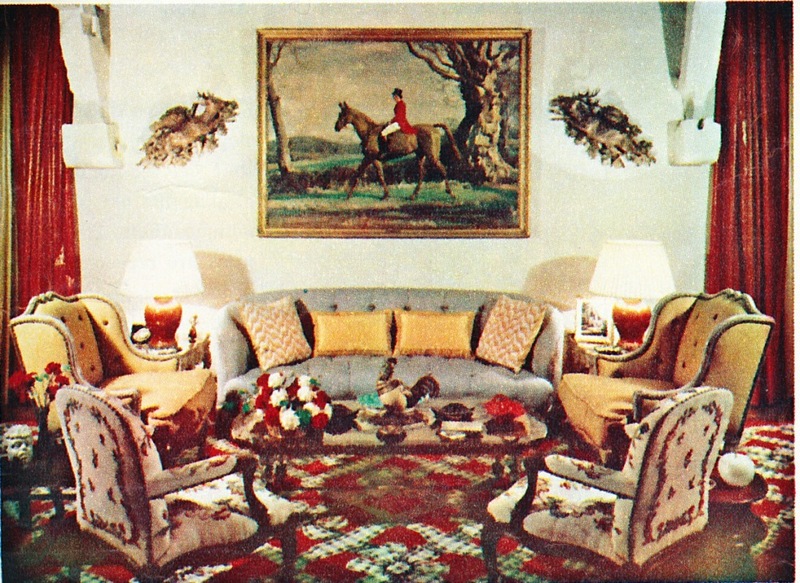 While I find traditional decor's lack of broad appeal to be depressing, I did take heart in readers' comments. 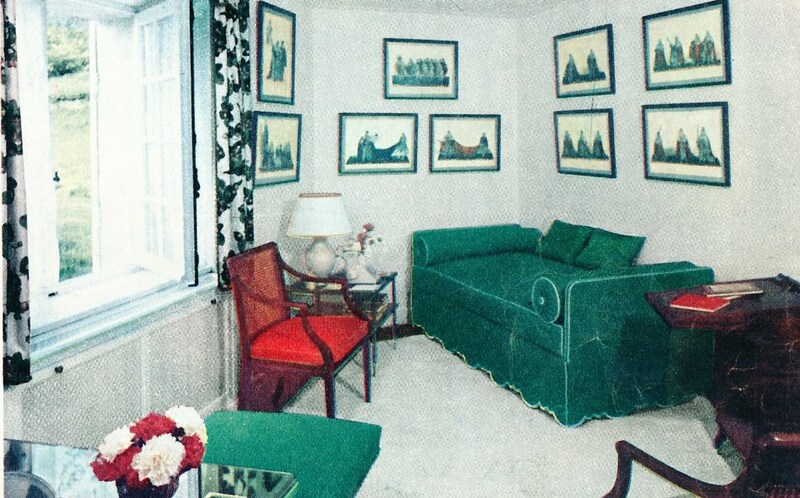 It seems that many of them, like me, preferred the pre-staged version of Beaujard's apartment, while others bemoaned home buyers' lack of imagination. So with that in mind, I'm once again showing the "before" of Beaujard's apartment. If you'd like to see how it looked after being staged, please click here to visit the Corcoran listing. 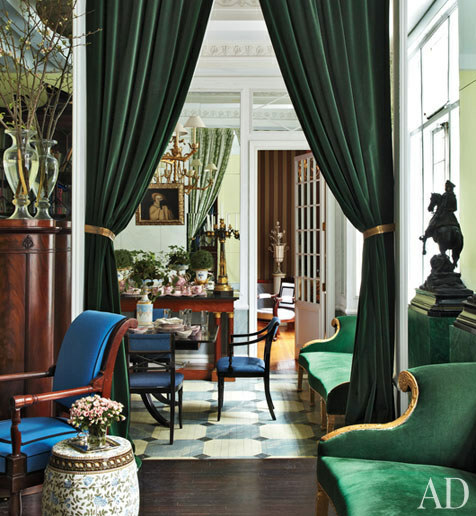 All photos from Architectural Digest, Miguel Flores-Vianna photographer. About eight or nine years ago, I had the opportunity, thanks to a friend, to meet privately with Albert Hadley. Because our meeting was one of those "pinch-me" moments (at least, it was for me,) much of what we discussed is a blur. But Mr. Hadley made one comment that I will never forget. He said that today's magazines feature too few illustrations. His comment struck a chord with me, because I'm an avid fan of illustrations, especially those of interiors. 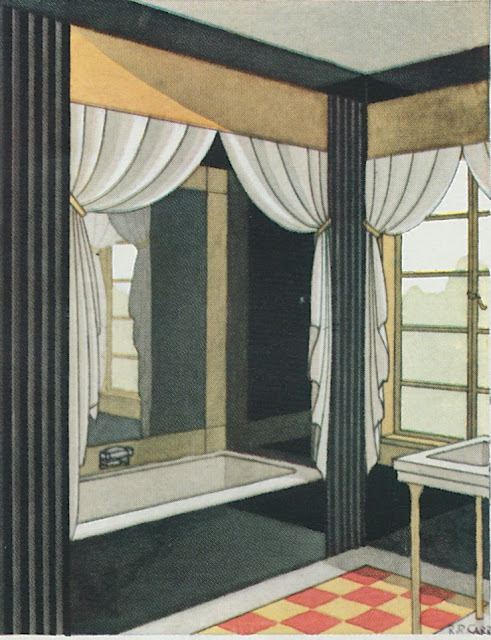 When executed by a deft hand, interior illustrations can convey a room's personality in a way that photography simply can't. 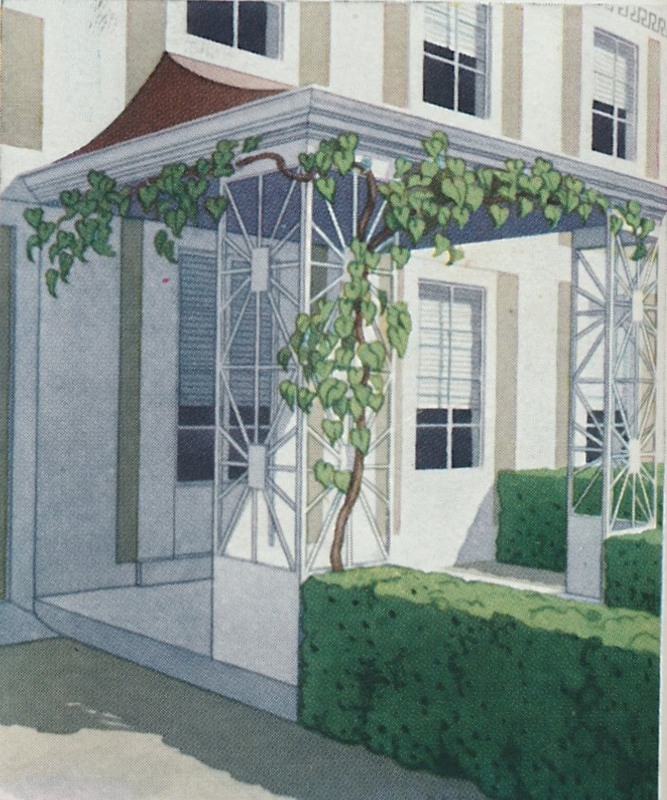 Take these illustrations, for example, which appeared in a 1934 issue of House & Garden. Depicting an "all-metal house in a traditional style" (the house's architect, Robert B. Carr, specified that the make-believe structure be constructed of "enameled metal shingles over steel braced structural walls",) the illustrations show an inventive marriage of Regency-style flourishes and then-cutting-edge finishes. What I find so beguiling and, yes, inspiring is the style of the illustrations. 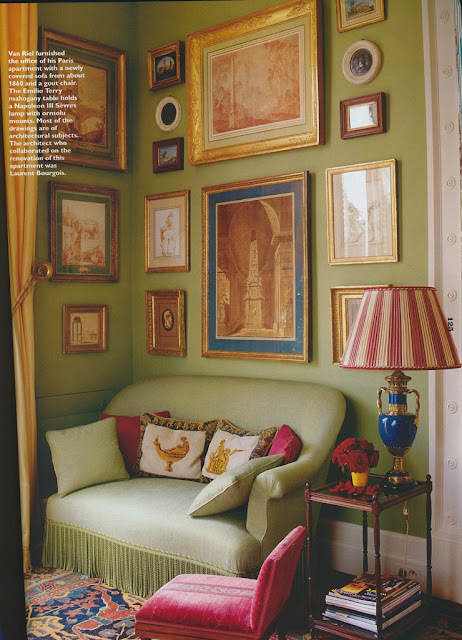 They are colorful and concise in a way that really captures- and even amplifies- the decorative essence of each room. 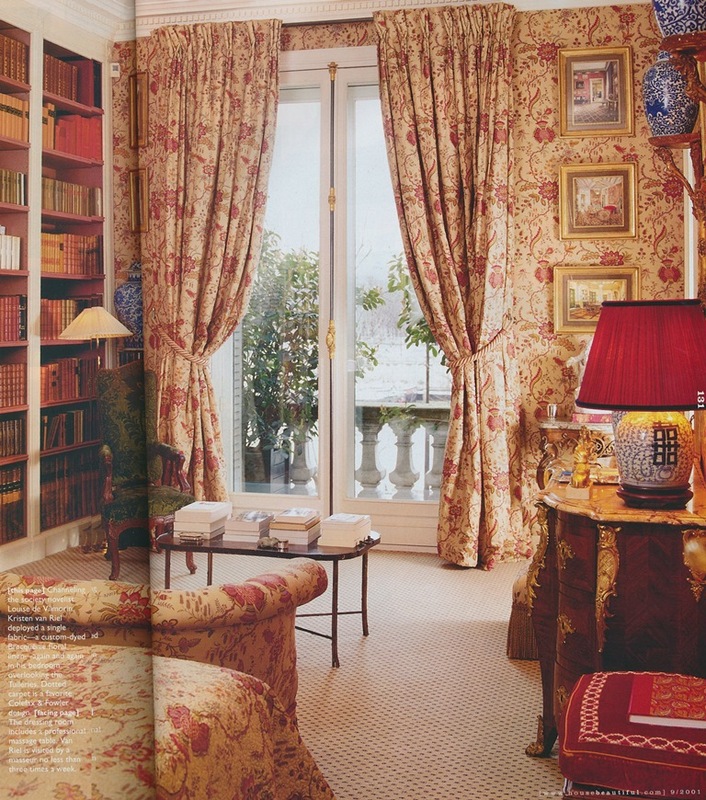 And because the rooms are anonymous, I find it easier to imagine myself inhabiting these spaces. Finally, although there are dated elements to these rendered rooms (that fish-tank table in the living room illustration should be left to the 1930s,) many of the colors and decorations still look fresh today. Can't you just see the bathroom's bright blue door with gold star (see below) in a stylish home of today? 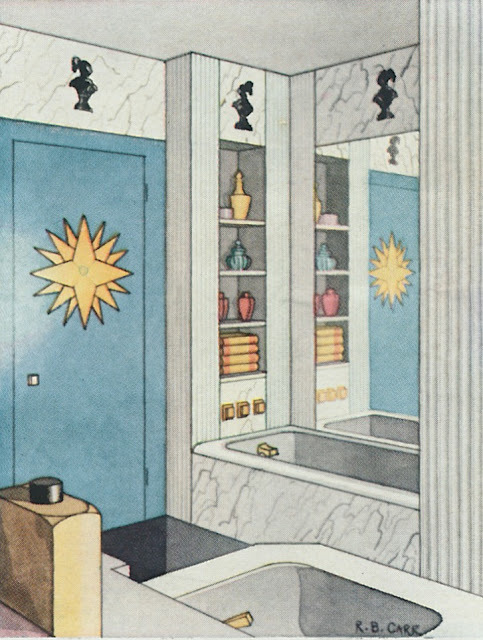 Would magazine pages full of interior illustrations fly in today's world? Probably not. But I agree with Albert Hadley that interior illustrations still have relevance. 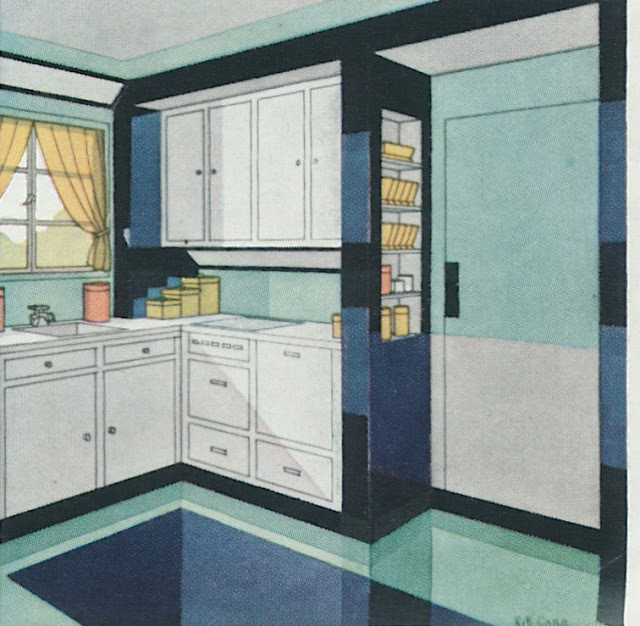 The benefit to such illustrations is that they stimulate the reader's imagination, requiring the reader to flesh out details and adapt the illustrated ideas for use in his or her home. 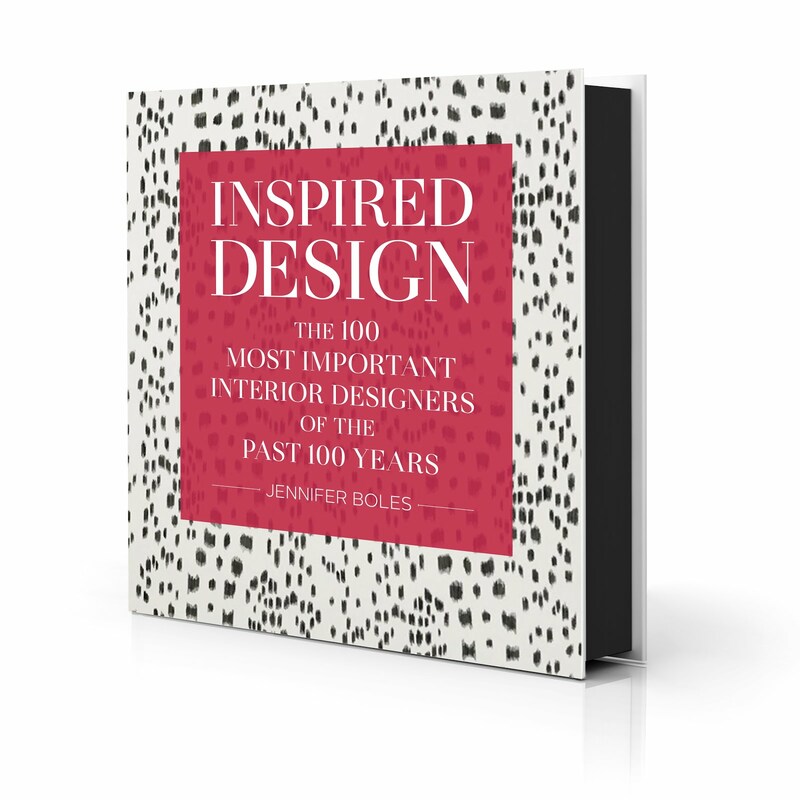 And it's imagination that gives design its flavor and its personality. After a long holiday, getting back into the swing of things has been a challenge, so much so that in the last few days, I've felt like saying, "Calgon, take me away." 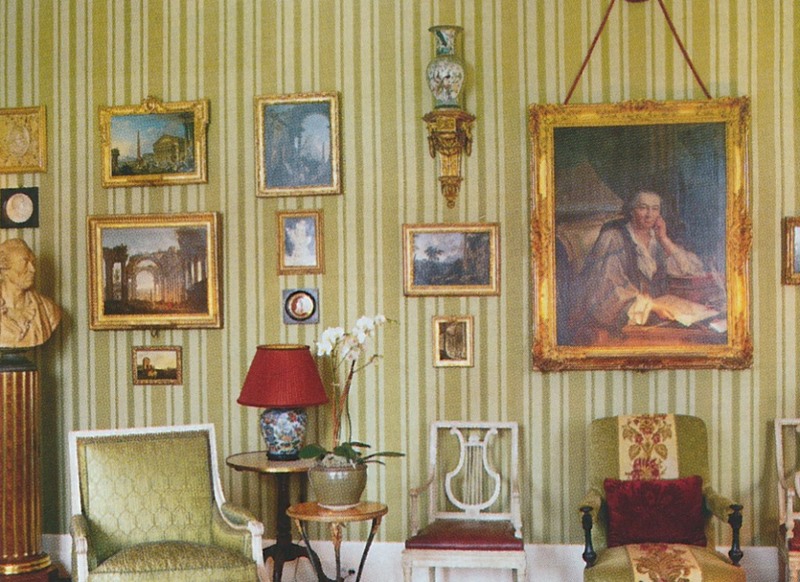 If a box of Calgon really could take me away for a respite, I'd wish to be transported to this Paris apartment, one of the more memorable Paris dwellings to have been published in the last fifteen years. (Well, memorable to me anyway.) 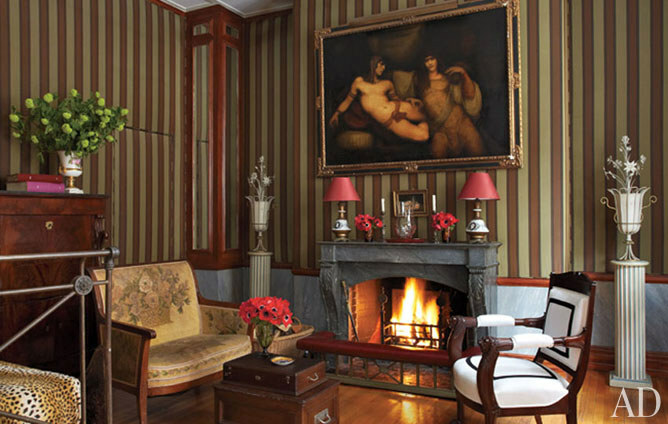 Owned and decorated by financier Kristen van Riel and published in the September 2001 issue of House Beautiful, this Left Bank apartment is a bastion of elegance, good taste, and quality, three things that seem to be in short supply these days. 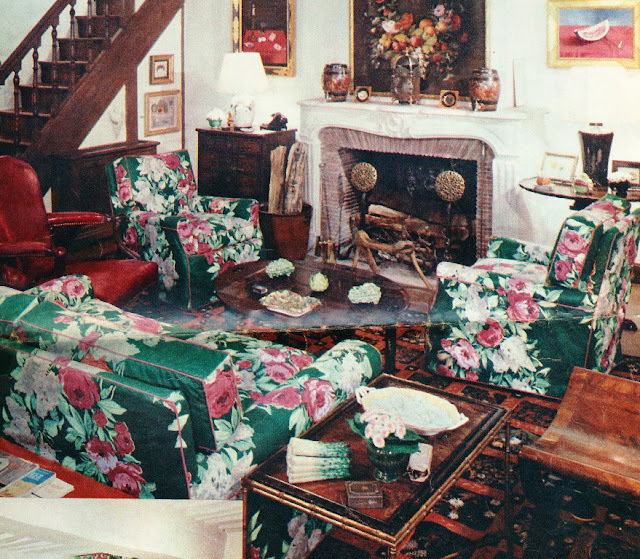 Look at the photos, and you won't see one piece of modern furniture. Contemporary art is absent, too, while antique engravings and oil paintings are in abundance. (By the way, I hear that the market for traditional oil paintings is tepid at best.) 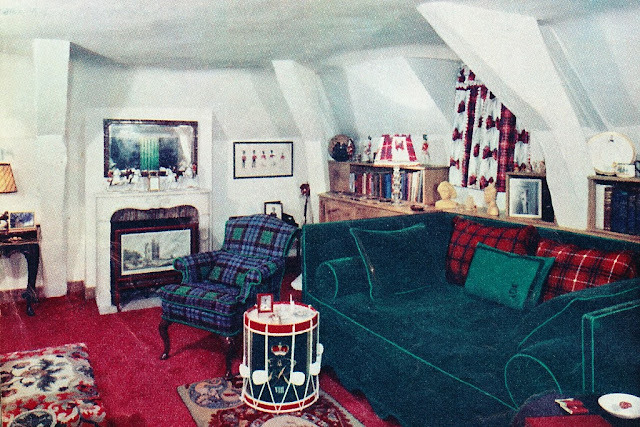 But rather than appearing old-fashioned, this apartment seems very much suited to our modern lives. The color palette is a pleasing mix of rich, energizing color tempered by anything-but-dull neutrals. 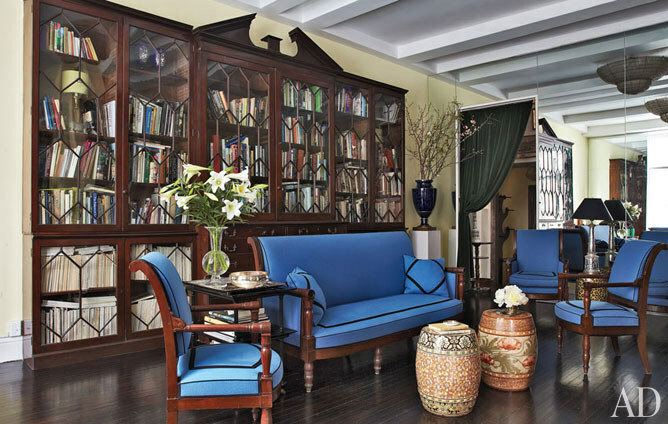 The homeowner's many collections provide the home with those all-important, comforting layers, but the rooms have an edited feel, too, which prevent them from being too weighed down by the past. And how nice would it be to escape the hustle and bustle of emails, social media, phone calls, and interruptions by settling down on that sumptuous red-velvet sofa, a book or magazine in one hand and a glass of champagne in the other? In fact, that's such a nice thought that I'm ready to be taken there immediately. Calgon, I'm ready when you are. 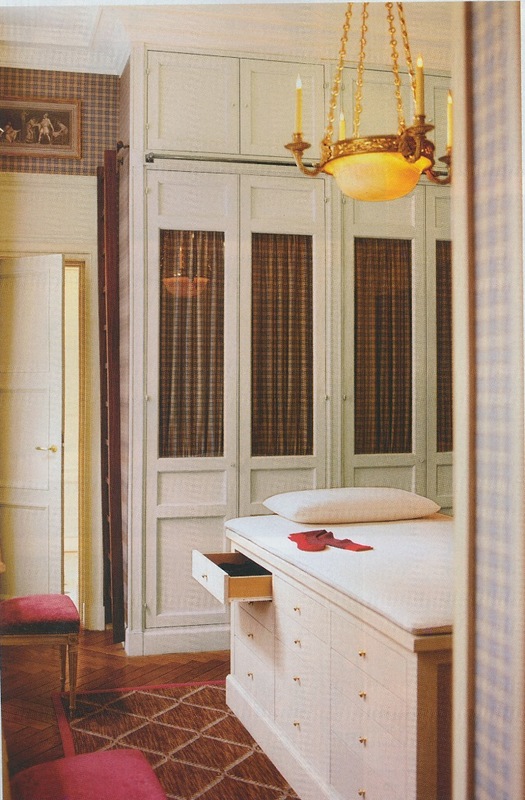 All images from House Beautiful, September 2001, Alexandre Bailhache, photographer. AmericasMart's biannual Atlanta International Gift & Home Furnishings Market takes place this week and next, and lucky for me, I only have to travel a few miles to attend. 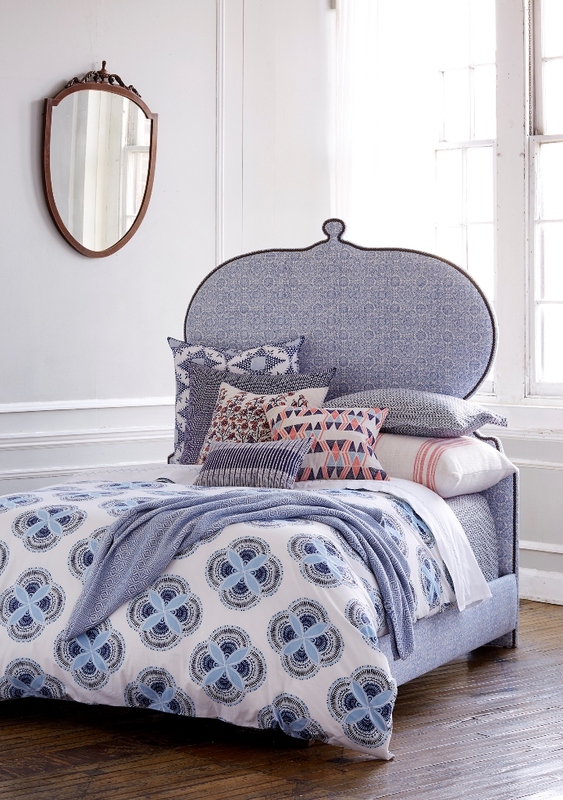 One of this Market's big stories is the opening of the Matouk-John Robshaw showroom, the first time the companies have partnered in a joint space. Located in Building One of AmericasMart, the 1426-square-foot showroom will showcase bedding from both lines, which are favorites of those with weaknesses for stylish bed linen. 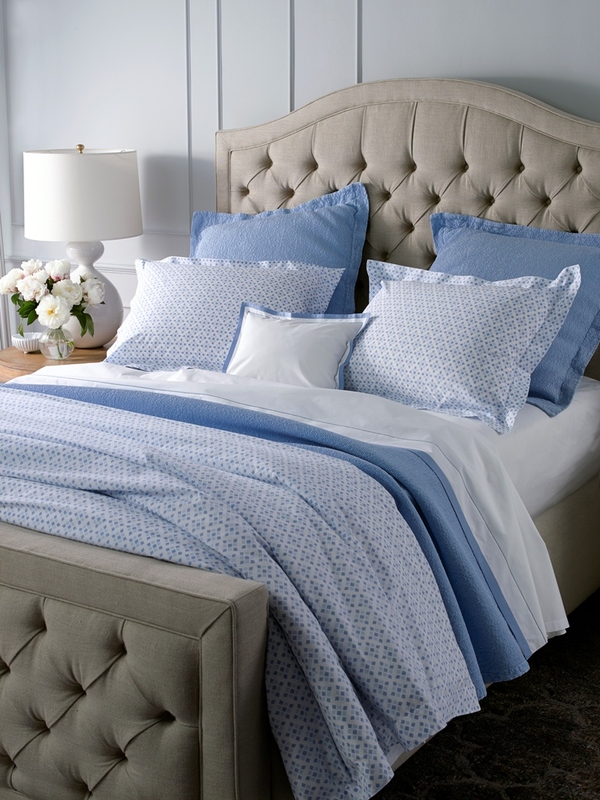 During Market, both Matouk and John Robshaw will be debuting new additions to their collections. Shown above are Minerva, Delilah, and Cassidy, all by Matouk, while below, you can see John Robshaw's newest designs: Mahzar and Firat, respectively. For more information on these Spring 2016 introductions plus their current collections, please visit the websites of Matouk and John Robshaw. 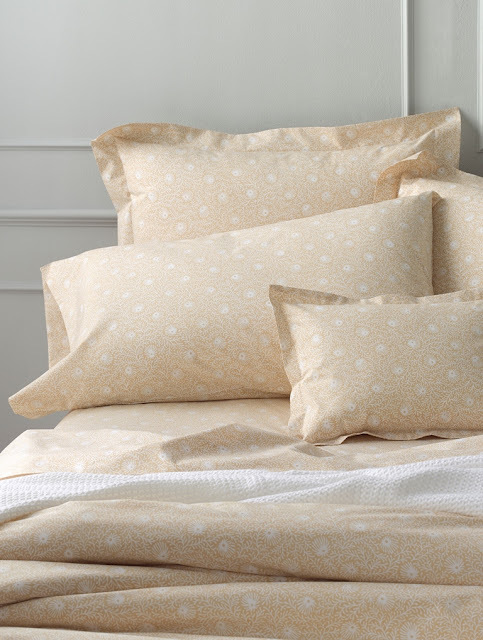 Or, better yet, see them in person at their new AmericasMart showroom. They are located in showroom #9A4 and will be hosting a cocktail party on Friday evening at 6pm. By the way, I'm looking forward to attending Market this week as a participant in the inaugural Style Your Season program, a collaboration between AmericasMart and a select group of bloggers. Soon, I'll report on the products and trends that caught my eye during my visit. Stay tuned. All images courtesy of Matouk and John Robshaw. For part two of my series on the Mill, I am leading off with a photo of the dining room, which is my favorite room in the house. 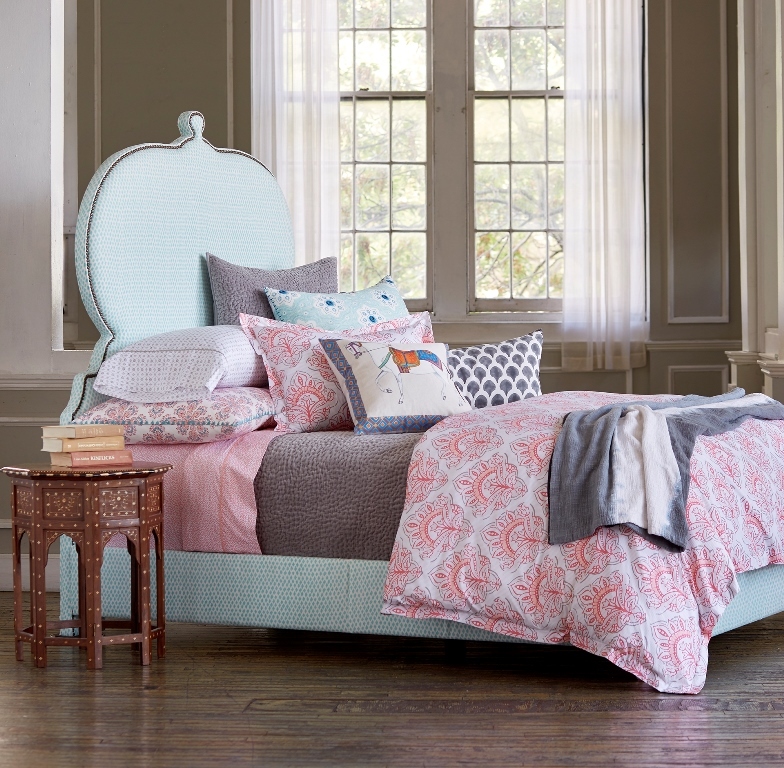 Originally slated to be embellished with bold colors, the Duchess decided instead to decorate it in subtle shades. She employed John Fowler and Mrs. Claude Lancaster of Colefax and Fowler to assist her with this room. 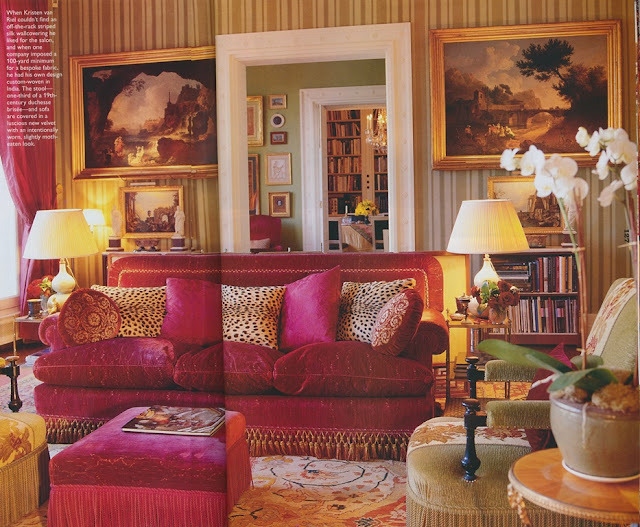 Fowler painted the room's bulrush and shell mural, which provided a charming backdrop for the Duchess's collection of trompe l'oeil porcelain as well as her painted furniture, while the floor's rush matting was another nice, tasteful touch. 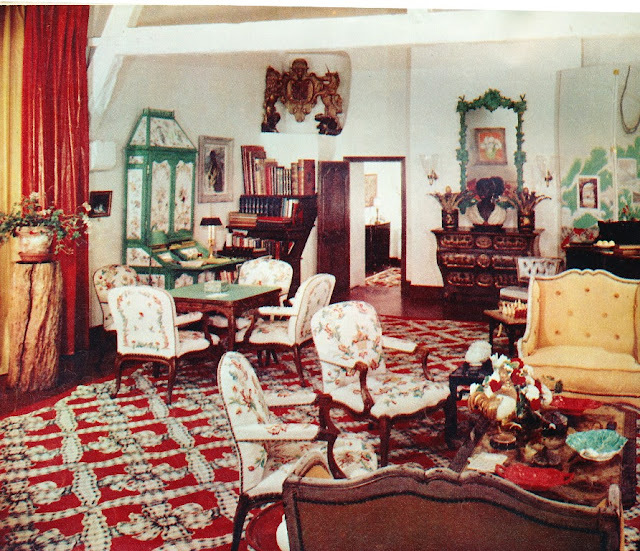 As you can see, the room is quite a contrast to the Mill's other rooms, something that the Duchess addressed in her article: "This room is a surprise to everyone- even to me- coming to it as one does from the brilliant colors and homey, chintzy atmosphere of the hall. 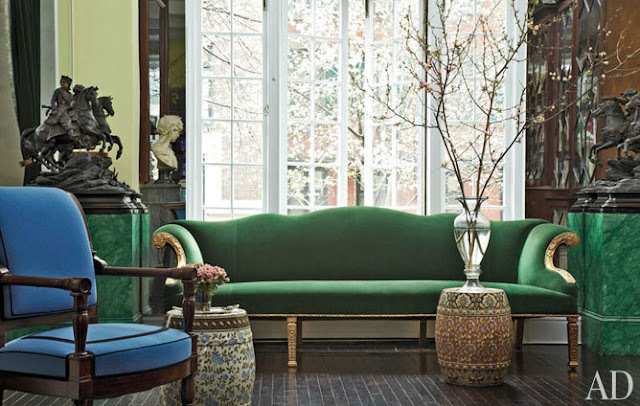 Sometimes I think the very contrast of the world of one talented decorator like Stéphane Boudin (who worked with me on the rest of the mill) with that of an entirely different talent is more dramatic than anything you might deliberately plan." 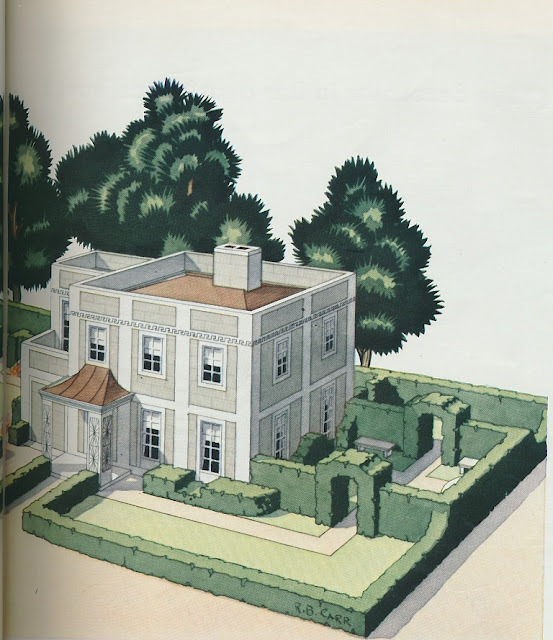 "Every house as it is lived in seems to me to take on a personality of its own; the Duke and I have tried to foster for our mill one of serenity and relaxation- with just a touch of gaiety- for ourselves and for our guests." "I enjoy my own parties but that's usually because everything has been planned down to the nth decimal place." "Although I can never be casual about entertaining, or about anything in the house for that matter, yet when really terrible things happen, I'm completely calm." "I am cursed- or blessed, I don't know which- with a photographic eye. I go into a room or a shop and I take in every detail, even without really trying, and can describe it all afterward." "Even for a small luncheon like this I plan the table setting as carefully as for an important dinner. 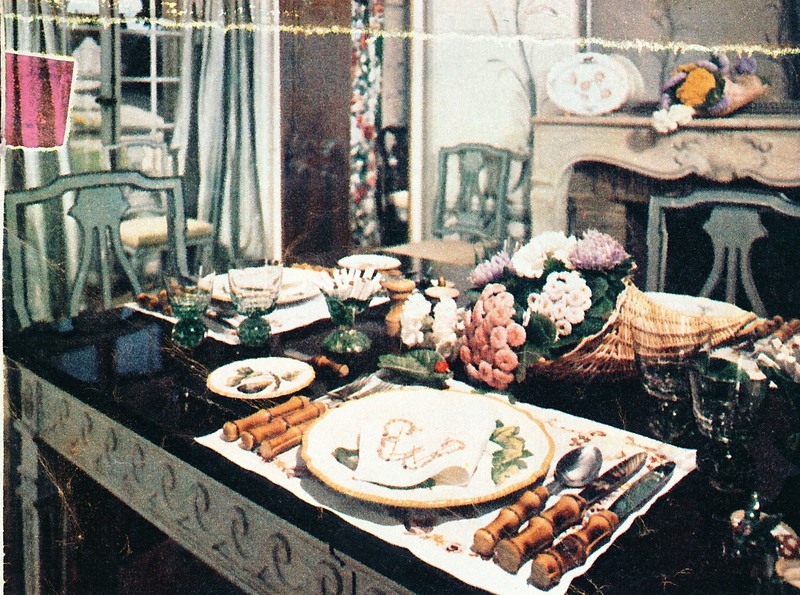 I like the contrast of the simple Italian pottery, bamboo-handled tableware and basket cornucopias of flowers with the rather elegant French and Italian painted furniture and the taffeta draperies of the dining-room." 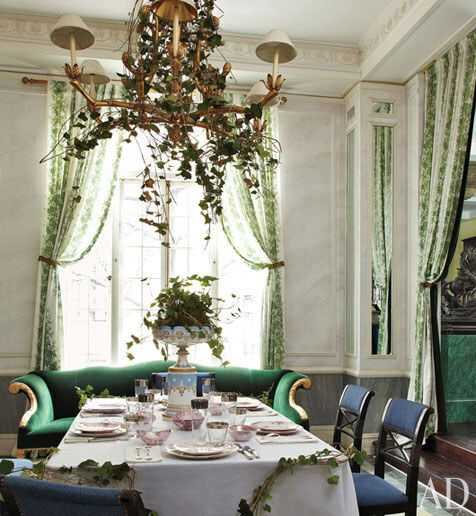 "This little sitting-room between the two guest rooms is only about 10 by 12 feet but by using small-scale furniture and rubbing the boiserie with light color, we gave it an air of space. The guest cottage is just one room wide- you enter the small sitting-room from the main courtyard and the French doors you see directly across the room open on the upper garden." 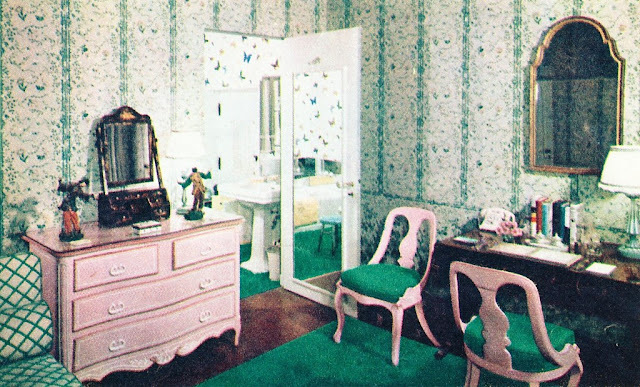 "Trellis bedroom in our guest cottage- we call it this because of the motif in the wallpaper. 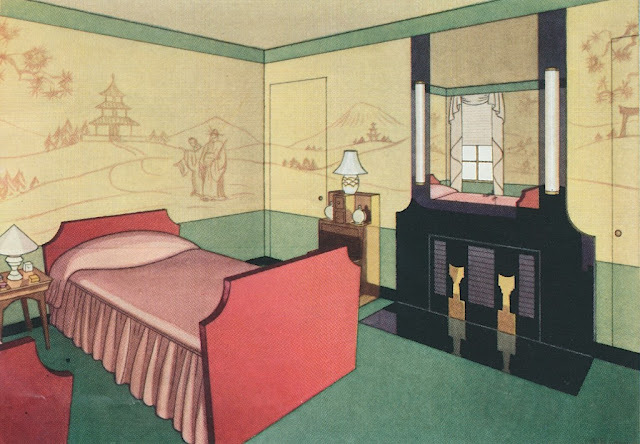 The dresser and chairs are painted to pick up the pinky-mauves in the paper and the lacquer mirror-stand and Oriental dancing figurines by Tony Duquette give the room a Chinoiserie accent. And notice the wallpaper covered with butterflies in the bathroom- it's my favorite!" "I love the vibrant red wallpaper in the other guest room. 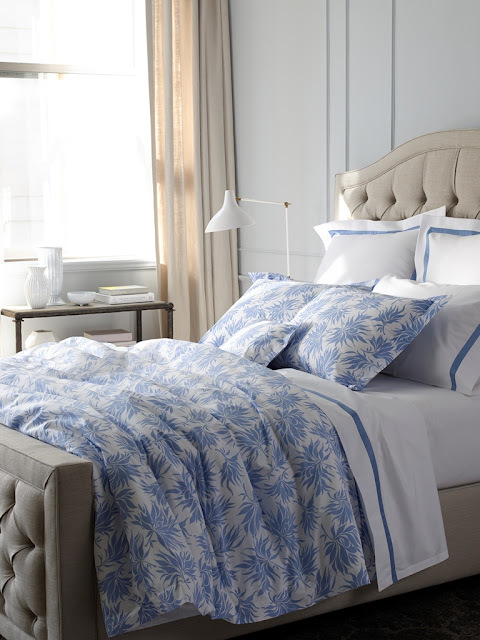 It's cooled off just enough by the tracery of white, the white rug and light blue curtains and bed cover. On the painted Venetian chest are two Lunéville trompe l'oeil dishes- part of my collection of old French faience." 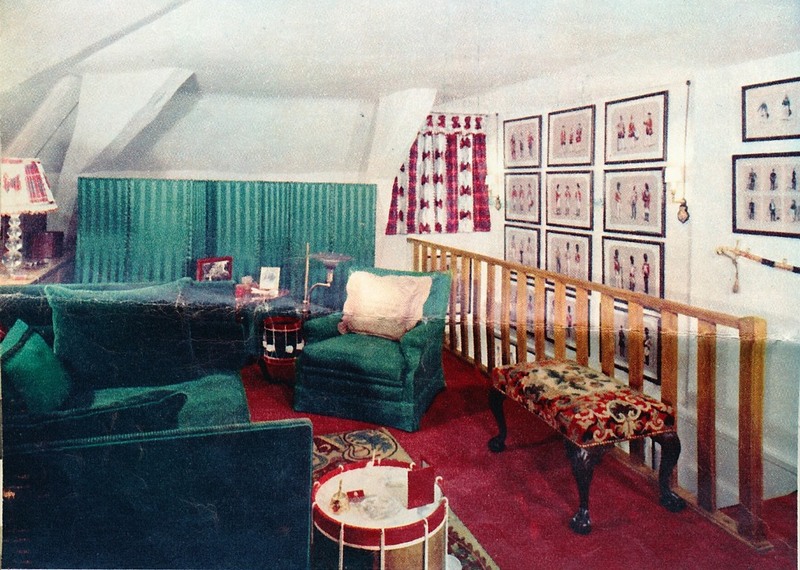 "We remodeled the old stables to make the two small rooms you see for bachelor guests. The irregularly shaped room is hung with pictures of the coronation of George IV tying in with the Regency-flavored décor." "In the other bedroom, woven tapes form the bedspread, cover the bed frame and lend a color accent to an otherwise black and white setting." 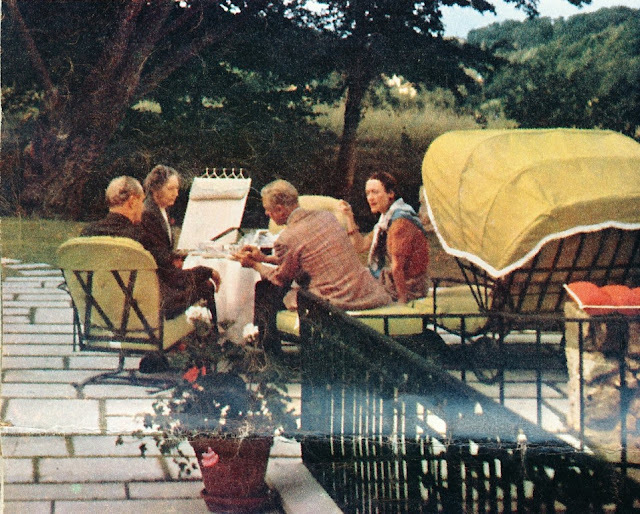 "After lunch we often have coffee on the upper terrace just outside the drawing-room. There we not only see and hear the waterfall but we have a wonderful view up the valley of the Merantaise. The Duke and I enjoy most entertaining our friends at the mill in small groups so that we can really talk with each one." "In late afternoon the trees around the millpond cast shadows across the upper terrace. 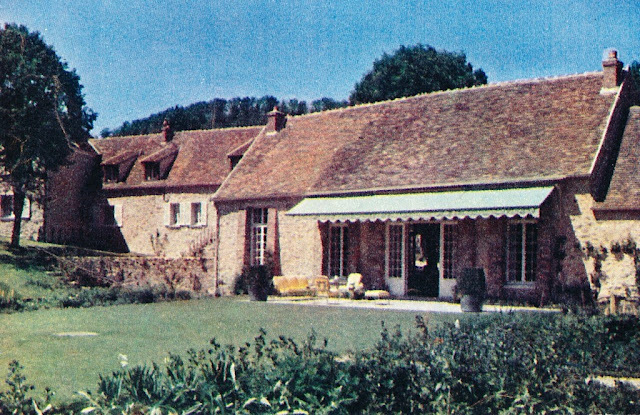 The wing in the background houses my bedroom and the large door to the right opens into the drawing-room. The stairway in the corner goes down to a little areaway with a door leading to the entrance hall of the mill." "We turned a small building attached to the old barn into this outdoor dining-room- delightful for entertaining in warm weather. 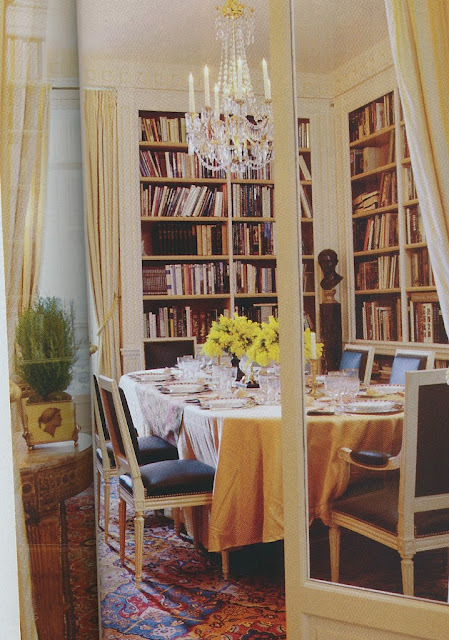 It overlooks a flagstone terrace and the garden; beyond the door in the back wall is a serving pantry. 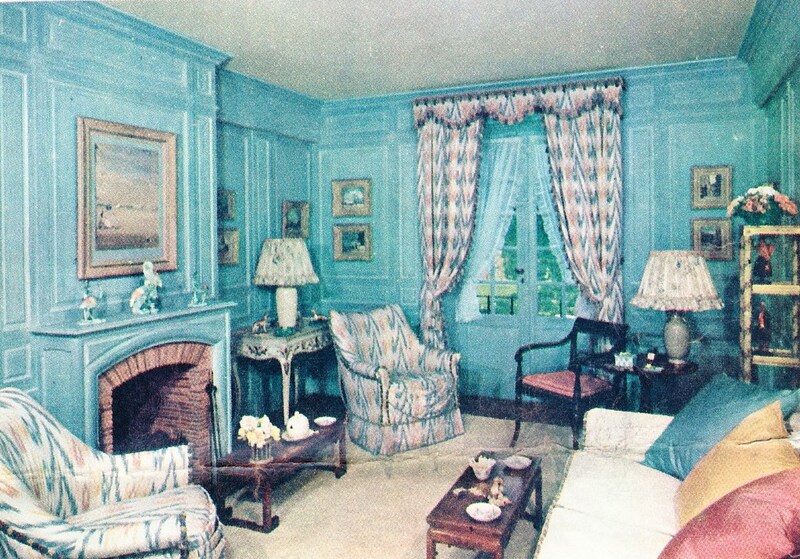 On bad days, the sailcloth curtains are drawn to protect the room's furnishings." "Our chef, René Legros, who was with the Duke in England, thinks the mill's kitchen much too small as it is, compared to the one in Paris. 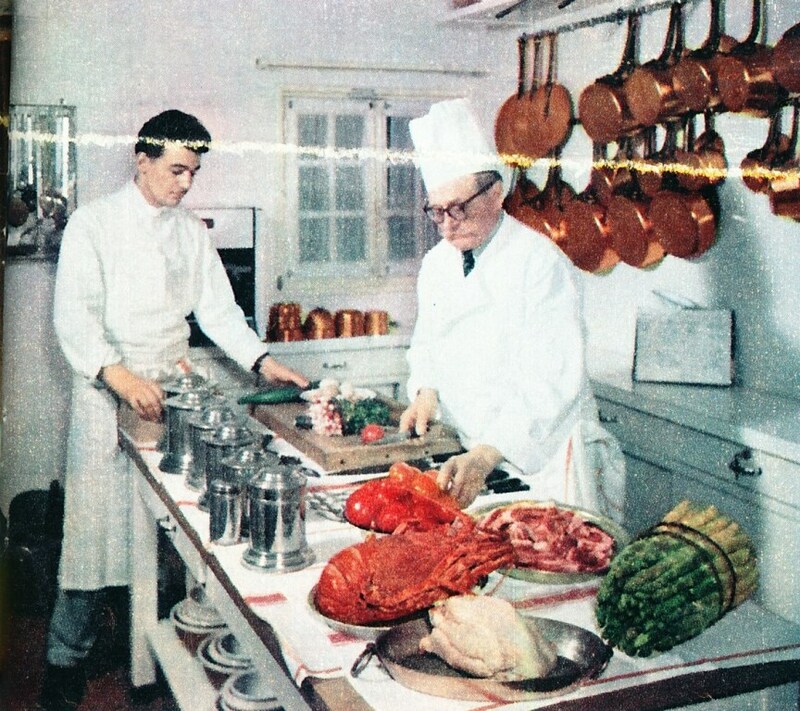 Here he is preparing a buffet luncheon to be served on the terrace: cold lobster, chicken pie, mixed vegetables, asparagus salad, glacé bananas, little cakes and cheese. The 18 copper pots hanging above are new, but those copper molds under the window are very old ones- they came with the Duke's things from London, and are stamped with the coat of arms of Queen Victoria." "This big comfortable room, once the mill's barn, is more than forty feet long. Most of the things here came from Fort Belvedere, the Duke's home in England. 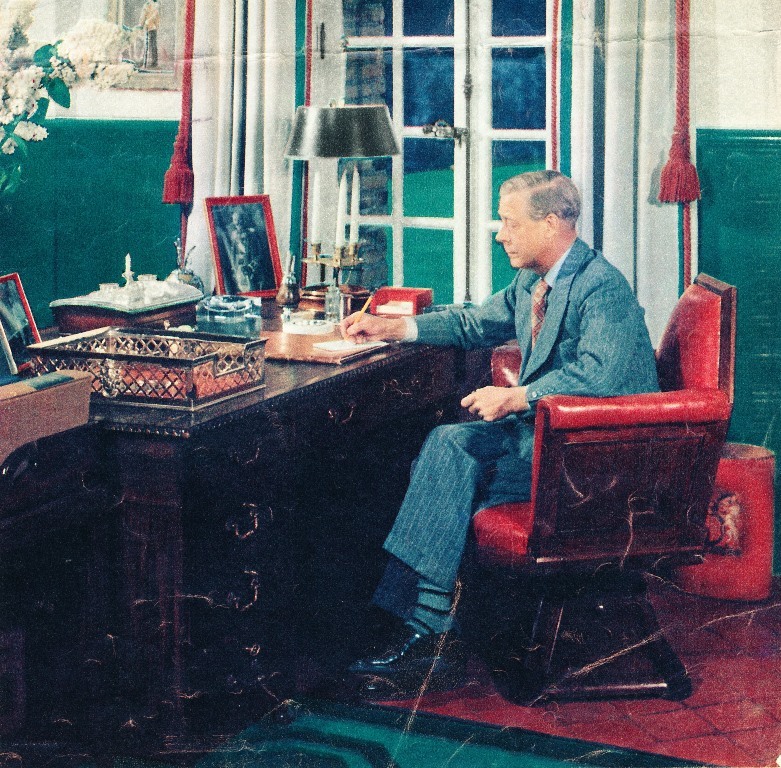 You can step through French windows to the garden and the Duke's desk is placed so he can look out on it. 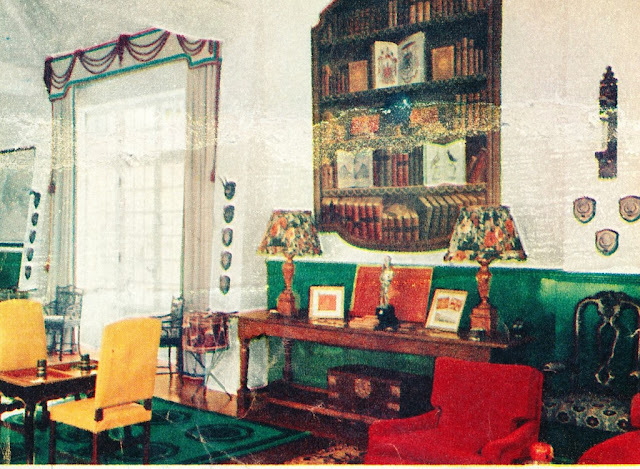 The small bookcase in the far corner holds the American and British, as well as the many foreign-language editions, of his book, A King's Story." "The huge map over the mantel is one the Duke had in London of the pre-World-War-II world- now appropriately antiqued. 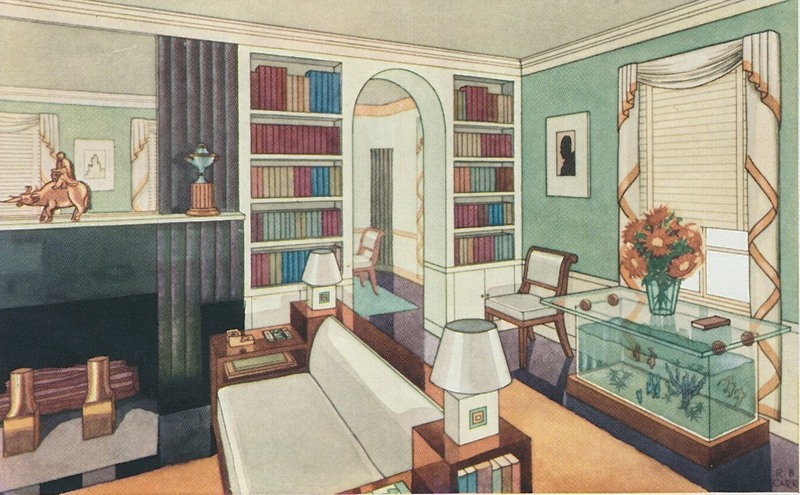 On the bookcase in the corner are folders containing addresses of welcome given to him as Prince of Wales on his world travels- also some more recent ones. The portrait head was done in the Bahamas." "You enter the room from the main courtyard through the wide French window. On either side of it are Grenadier Guards drums and bugles; on the wall mounted on shields are shoes of the horses the Duke rode in steeplechases he won. 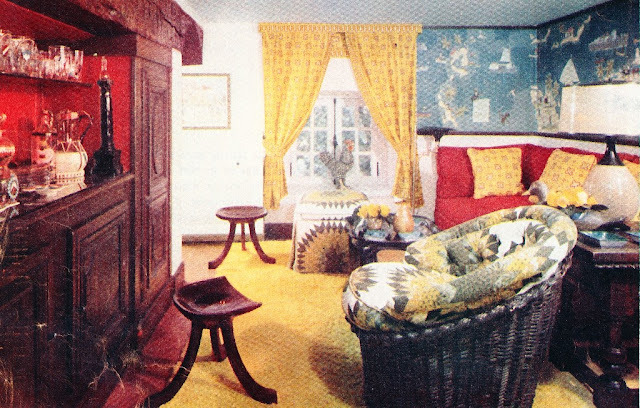 The trompe l'oeil painting over the table hid the pipes of an organ in our former Paris house." 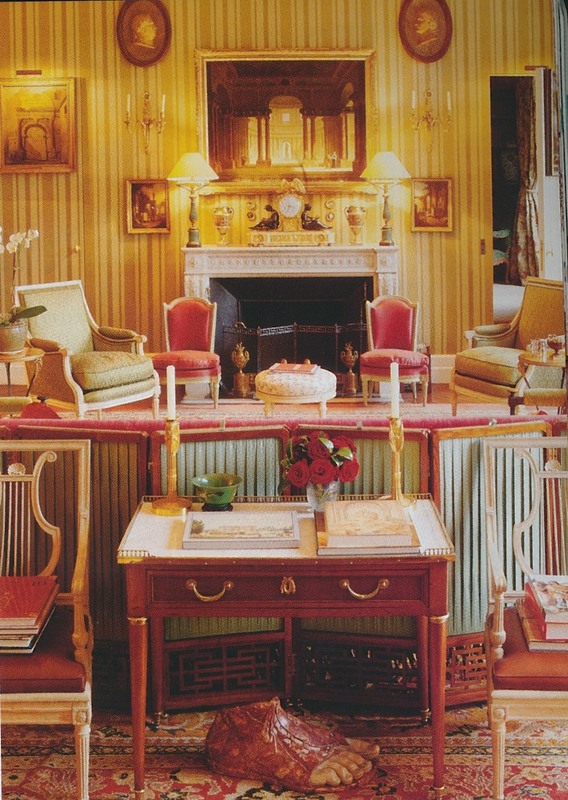 "The most historic piece in the room is the table at the left of the fireplace- the one at which the Duke signed the Instrument of Abdication. The map above the mantel shows off his official engagements as Prince of Wales. On the left wall hang three of his collection of ceremonial bagpipe banners; the coffee table is made from a drum of the Welsh Guards." 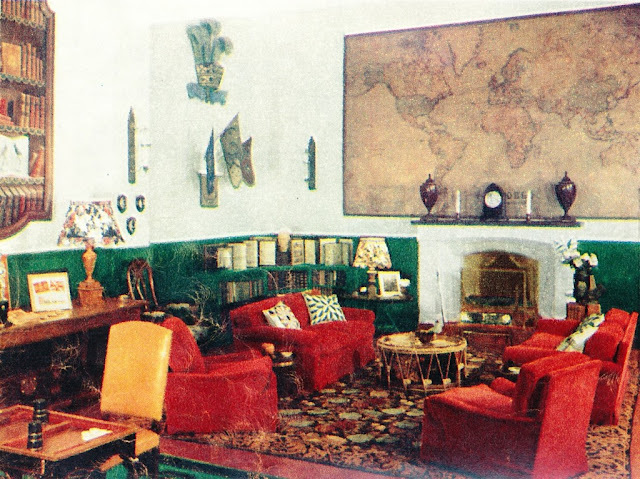 "We call this tiny room off the drawing-room our Bahamian bar because of the map of the Islands over the sofa and the other souvenirs of our five years in Nassau. 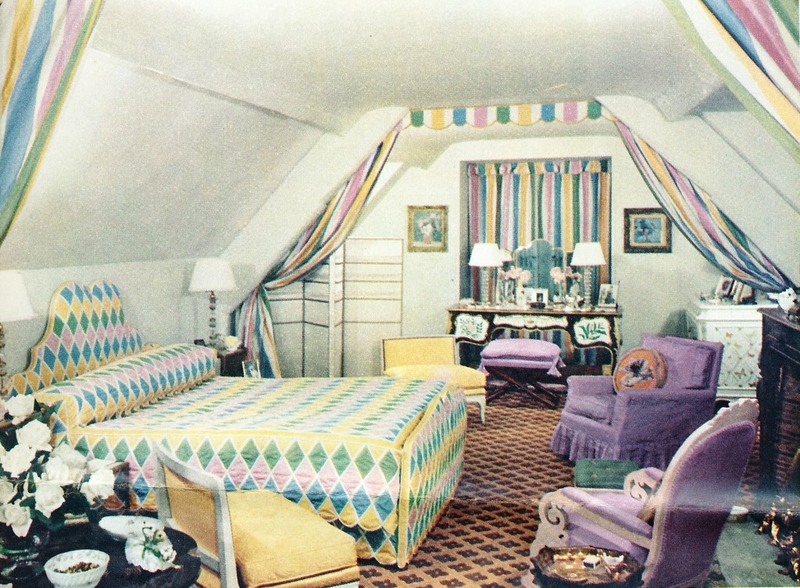 The ceiling is less than six feet- tall friends have to stoop- but everybody seems to love this room, crouch and all." 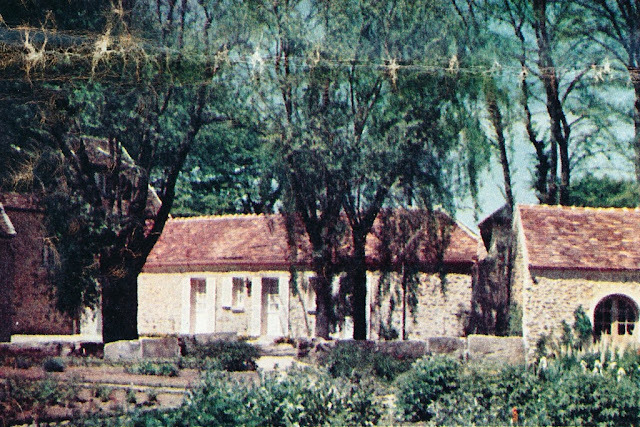 "By turning left, from the garden you also get this view of the barn with the flagged terrace and awning. 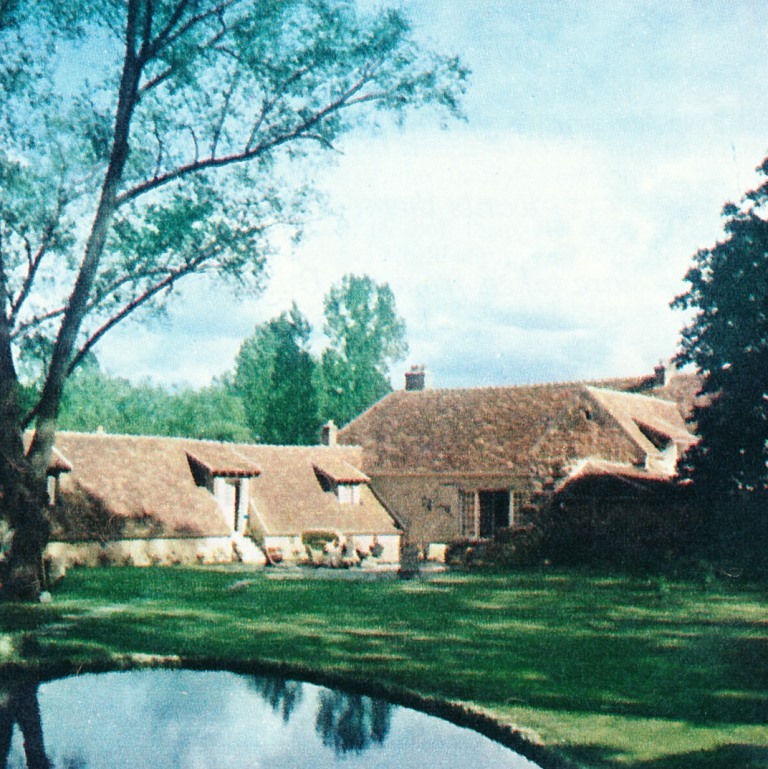 Beyond the barn you see part of the guest cottage and upper garden. At the bottom of the slope too low to show here is another small branch of the river." "Here you see the wing for bachelor guests from the garden. The tall trees behind it- some are weeping willows like that in the foreground- shade the millstream. Beyond the tool house is the old river gate and an old stone bridge over the Merantaise River." 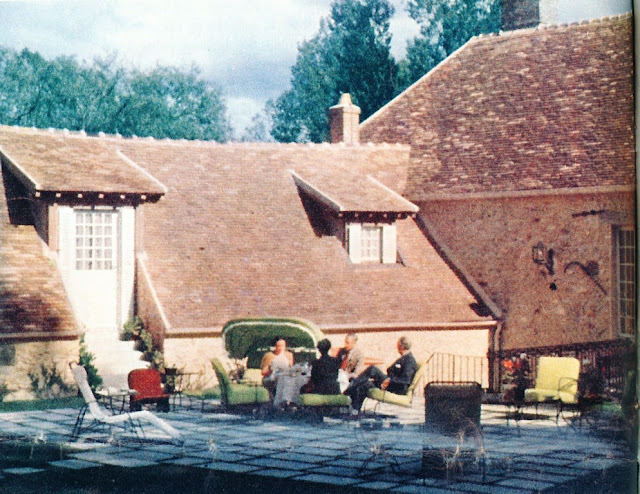 As I've said before, I don't consider the Mill to be on par with the Windsors' Paris home, which was really most attractive. 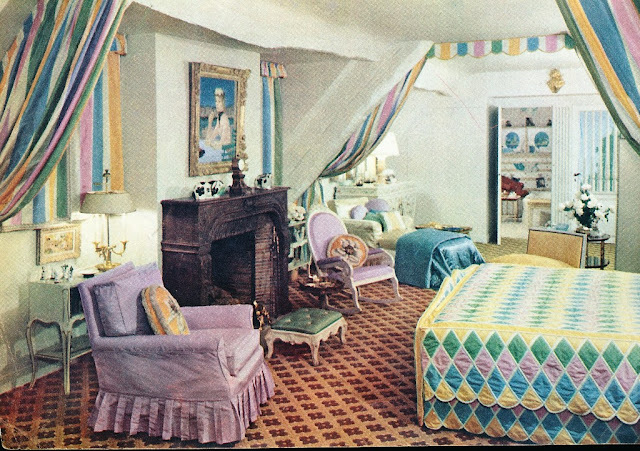 I find the colors of these interiors to be jarring to the eye, and some of the decorative combinations are rather odd. 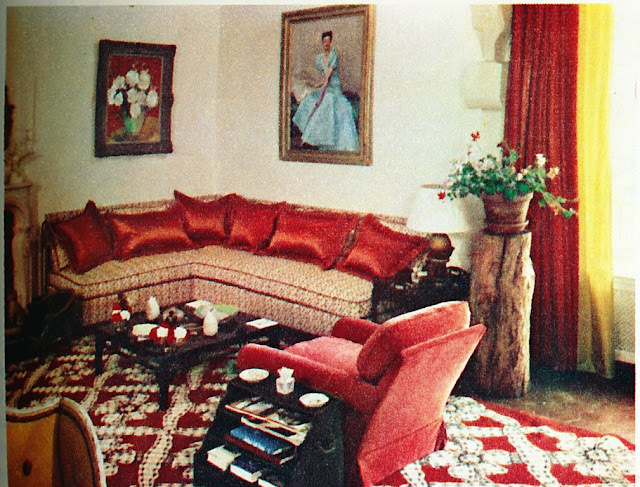 (One such example, seen below, is the drawing-room banquette, which was accented with red satin cushions. Alongside it was a corduroy-upholstered chair. See what I mean?) That being said, I relish these photos, because they provide a glimpse into the lives of a stylish couple who, rightly or wrongly, fascinate me. 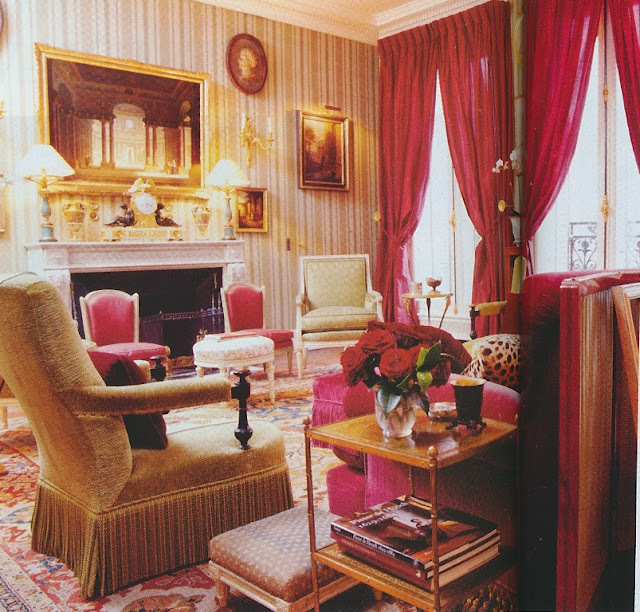 You might recognize some of these photos, for they later appeared in Suzy Menkes's terrific book, The Windsor Style . Because the article featured so many photos, I'm dividing them up into two blog posts. And I've also included the original photo captions, because they're too good to overlook. 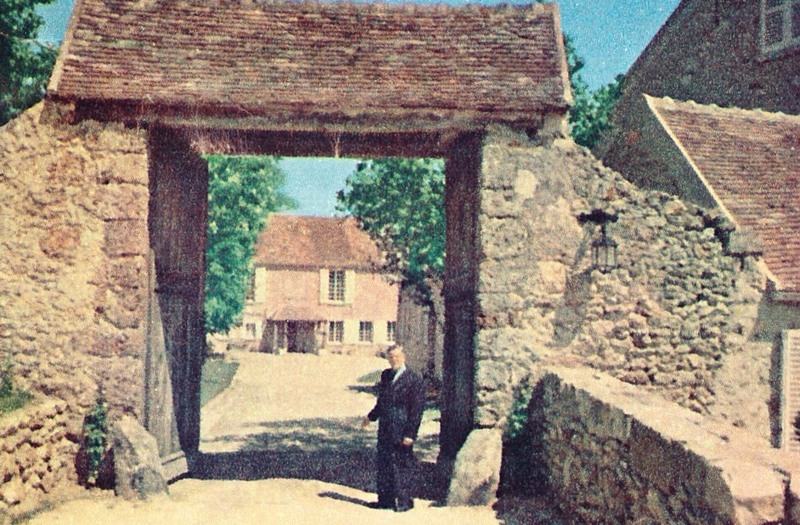 "Our Moulin de la Tuilerie as it looks through the entrance gate." 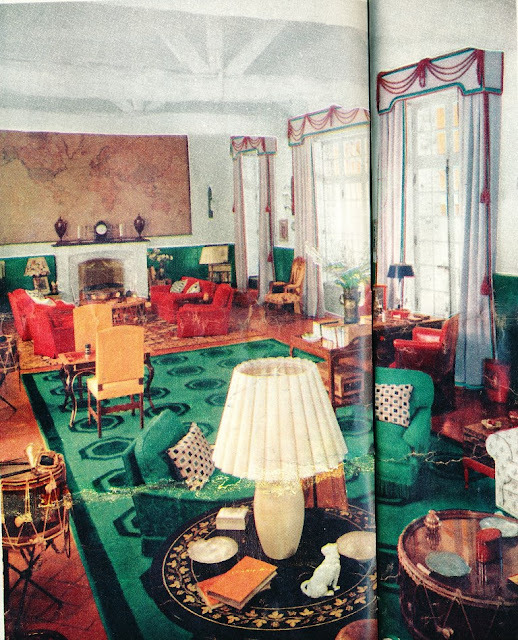 "Sometimes I think the big hall is my favorite room- it's so cheery and comfortable. The overscaled chintz was chosen to heighten this effect. The low leather chair is the Duke's pet and the funny twisted-root stool on the hearth he used to sit on to rest while elephant hunting in East Africa. The stairs in the corner lead to our bedrooms and to the drawing room." "This group in the hall just inside the front door is worked out around a red and gold Louis XV chest I had in my London apartment. The two still-lifes painted in 1839 were the first things we acquired especially for the mill- were originally intended for the dining-room. The big faience swan I bought from the people who most recently had been living in the mill- it seemed so right for the room. The high-backed chairs are old Irish ones." 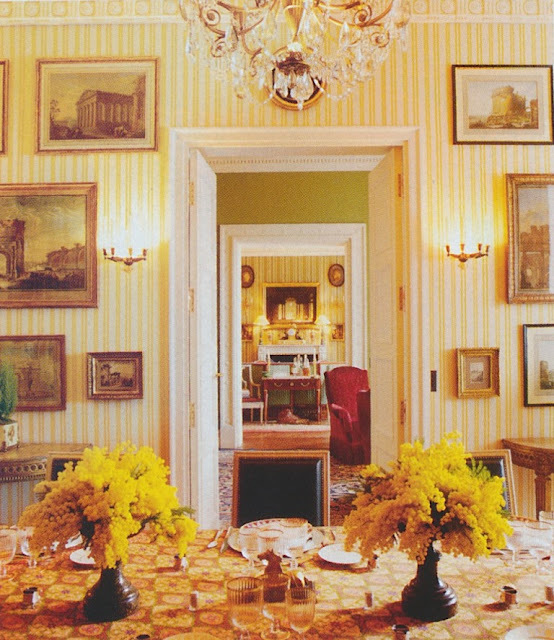 "This view of the hall from the pantry side reveals the dining-room door across the room- not too convenient for serving, as you can see. The rug under the sofa group is of felt embroidered in floral squares- I bought it years ago hoping to have a place for it some day. Gravestones in the floor were stolen from cemeteries during the French revolution- fortunately nobody's under them." "You step up through that tiny door in the center of the picture to reach the drawing-room. The sloping shelves behind the door cover the main stairs to the hall below. To give this forty-foot room the height it needed we removed the floor of the old loft above it, thus exposing the beautiful cross beams and buttresses. The screen behind the piano- a map painted by Drian- carries the carpet design up several feet like a dado." "To give you some idea of the size of the room- the baroque mirror over the fireplace is ten feet high. 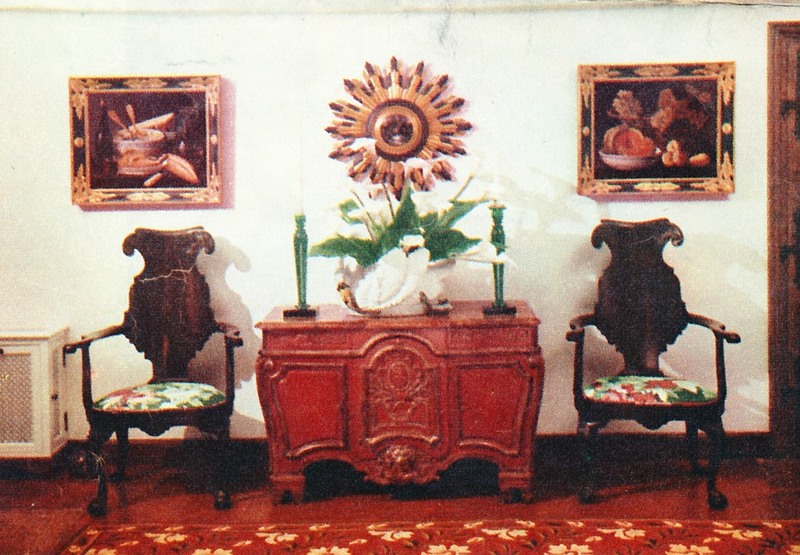 On either side are the two paintings by Lorjou which suggested the color scheme of the room. 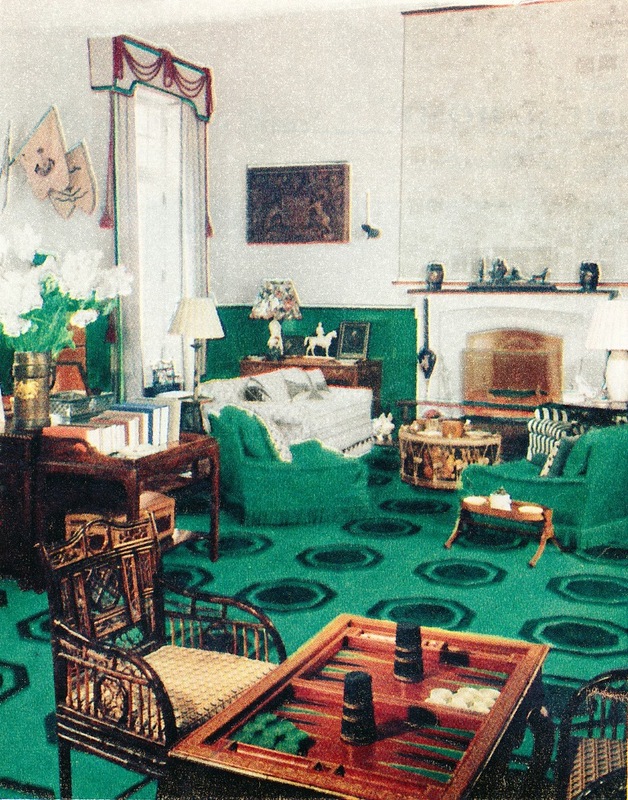 The carpet was especially designed and woven but most of the furnishings are things we had- done over. The small door by the fireplace leads to our Bahamian bar." "The banquette around the corner to the right of the fireplace contrasts a Jacquard-textured cotton with shiny satin cushions- the chair is covered in corduroy. On the wall is the almost life-size portrait Drian did of me at the time of my marriage. The tree-trunk pedestals holding geraniums were in Drian's old studio in the barn." "The sofa group is dominated by the famous picture Sir Alfred J. Munnings painted of my husband on horseback when he was Prince of Wales. On each side hang old French hunting carvings. 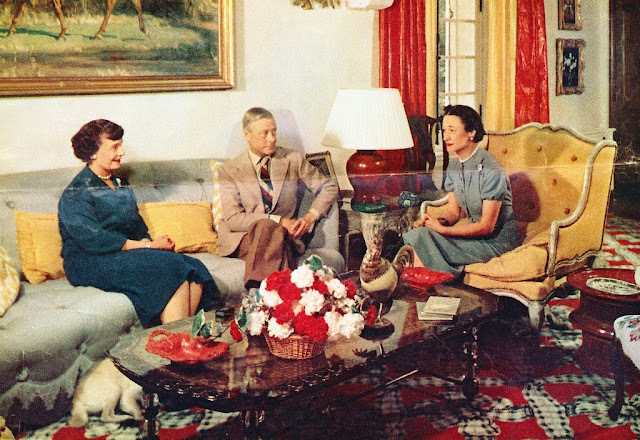 The coffee table, given us in Nassau, has a map of the Bahamas in black and antique bronze painted under the glass top." "This shows how my room looks as you first come in. The far window behind the dressing table opens over the millstream; at night its gentle murmur makes such a relaxing sound to go to sleep by! The clear pastel colors are those I've always been fond of- they also harmonize with the two painted chests (you can see a corner of one on the right) that I've had since we were first married. The little Victorian rocker in the foreground, painted to match the room, belonged to my grandmother in America." 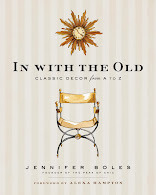 "My bedroom is long and narrow with sloping beams, a little like a tent- so I decided to emphasize this by draping the old beams with striped antique taffeta. The colors in the curtains are repeated in the harlequin bedcover- a present from my husband on my last birthday. Its pieces are put together by hand like a patchwork quilt- I had decided it would be too expensive but the Duke ordered it for me anyway as a surprise. 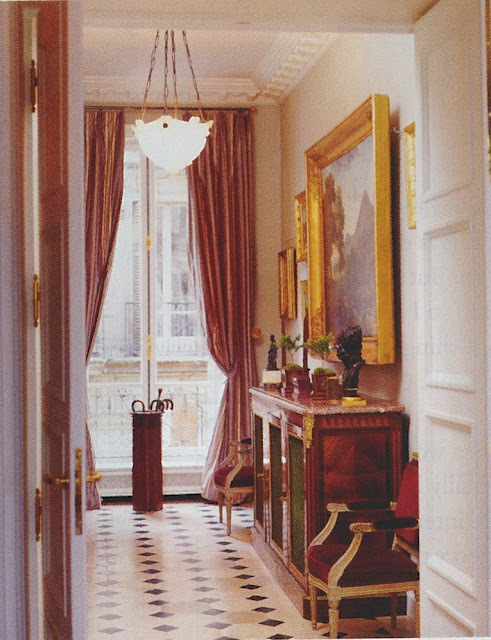 The door in the far wall opens to the bathroom; at the right next to it is the entrance door from the upper landing." 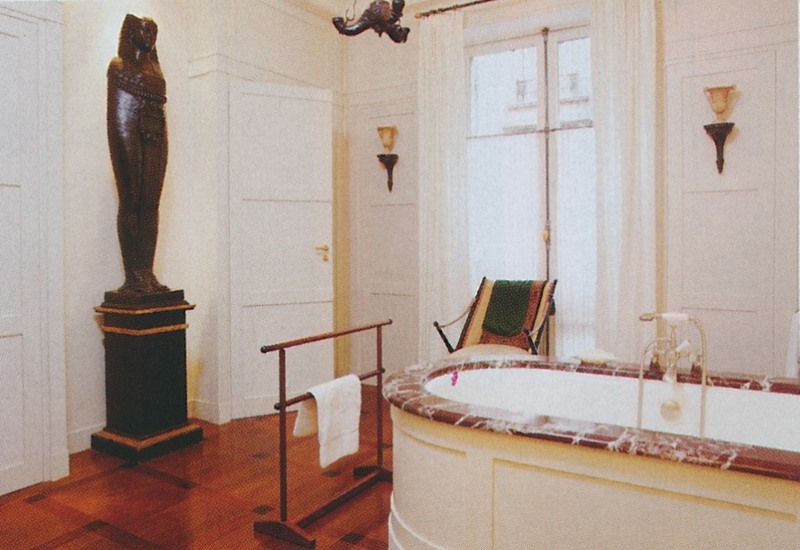 "My painted trompe l'oeil chest gave us the idea for decorating the bathroom. 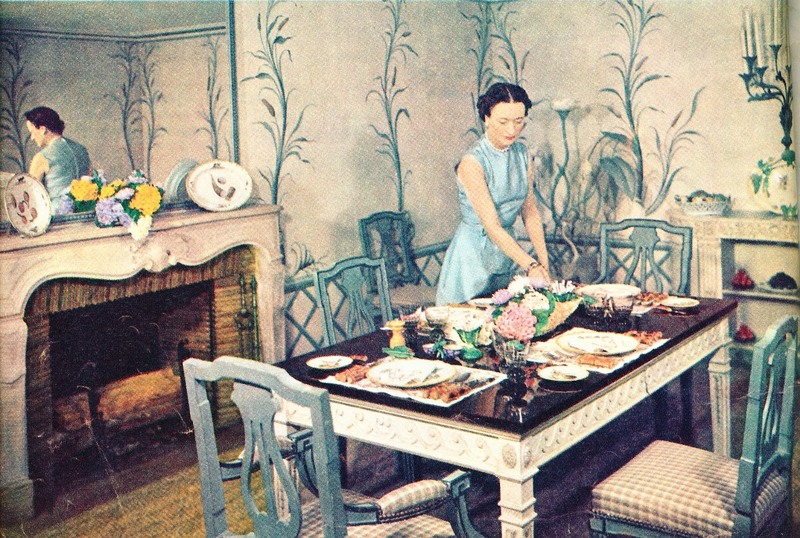 We painted the walls with the same wood grain, adding amusing trompe l'oeil symbols held up by red tape- things like the jacket of A King's Story, gloves, opera glasses, bouquets of flowers, butterflies, a dog leash." "To me flowers are an important part of the decoration of a room and one of my hobbies is arranging them. I always like white flowers in my own room. Sometimes they're a low arrangement like the roses opposite; sometimes tall, like the one here of calla lilies and spiky eremurus." "All the furniture here came from Fort Belvedere- the drum is one from the Grenadier Guards with the Duke's own cipher, ER VIII, used when he was king. The small clock on the mantel was a christening present from his maternal grandparents, the Duke and Duchess of Teck." 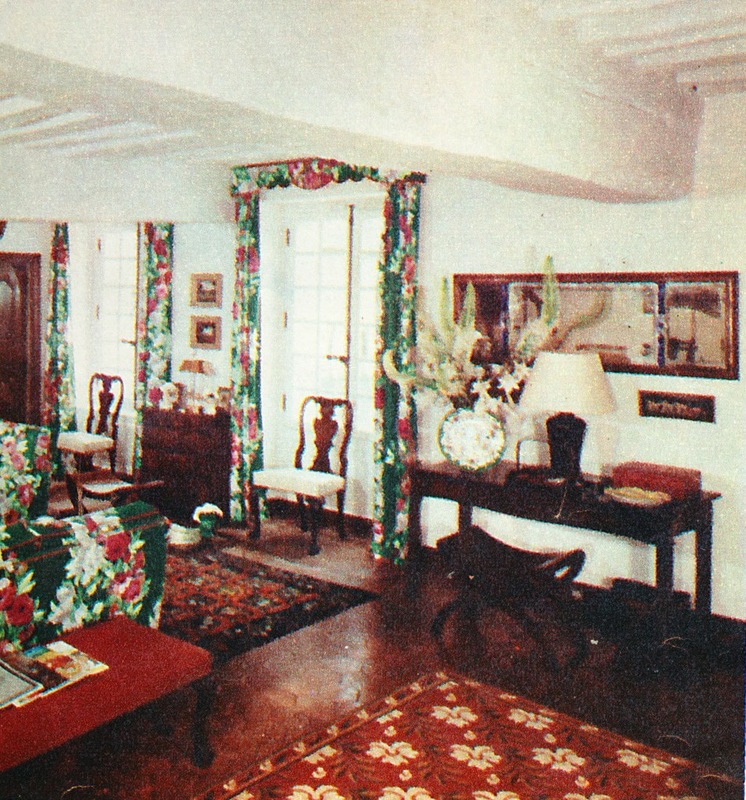 "The Duke's bedroom is also a quiet retreat. He has his favorite books and collections there- the old prints on the wall show the different uniforms of the Grenadier Guards from 1660 to modern times. A naval dress sword hangs there under prints of old navy uniforms." "One of our planning problems was the Duke's dressing room and bath just across the landing from my room. We solved it by building fixtures into closets and cabinets and setting a stall shower in one corner (for he prefers a shower to a tub bath). Stairs at right lead to the bedroom."